Unique, enchanting, luxurious, sultry, sensuous, elegant jewelry that lets your inner passions shine! Are you more than just a cog in the machine? Do you do more, are you more than someone who simply gets up to go to work and then comes home to eat and sleep? 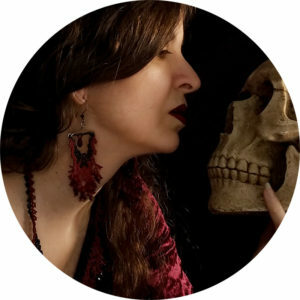 Maybe you are a geek, a goth, a gamer, or you’re into vampires, reenactment, fantasy, sci-fi? Do you find mainstream jewelry boring, uninspiring—impersonal, even? 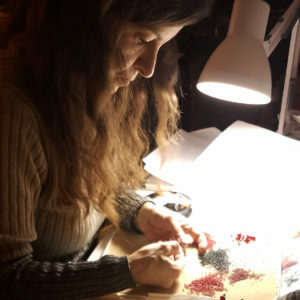 I’m Christine “Chris” Berni, and my passion is designing unique, enchanting, luxurious, sultry, sensuous, elegant beaded jewelry for people like you (and me) so they can express their true selves while still looking professional. The jewelry from my shop will make you feel great in your skin and confident in your individuality. I grew up in a ski resort in the Swiss Alps, where everyone seemed to be all about the outdoors and sports. Everyone but me, that is: I loved books, music, movies, learning, and creativity. In other words: Yes, I was that geeky Stephen King kid! 🙂 This disconnect extended into my clothing and jewelry style, and sources for items that suited me were limited to non-existent. Thankfully my mother did—and still does—knit, crochet, sew, and cross-stitch, and used her hands to create countless clothes for me. One year my sister, also a crafter, gave me a beaded necklace she had woven for my birthday. The tiny seed beads intrigued me. Later I inherited her beading loom and modest supplies, and soon I was hooked. One of my first pieces was a simple bracelet with the faces of Luke Skywalker, Leia Organa, Han Solo, and Lando Calrissian on it, adapted into a beading pattern from a Star Wars comic. (Sorry, Chewie, my wrist was simply too small to fit you in!) Right from the start I liked to put my own spin on things – and that hasn’t changed yet! Unique, enchanting,luxurious, sultry, sensuous, elegant jewelry to let your inner passions shine, hand-crafted by Christine “Chris” Berni. Do You Want Style Inspiration and Access to Exclusive Sales?